When Malaysians head abroad, one of the things they miss most is the food they grew up with. So it is for the thousands of migrant workers who clean our homes, cook in our restaurants, tap our rubber trees, and labor in our factories. 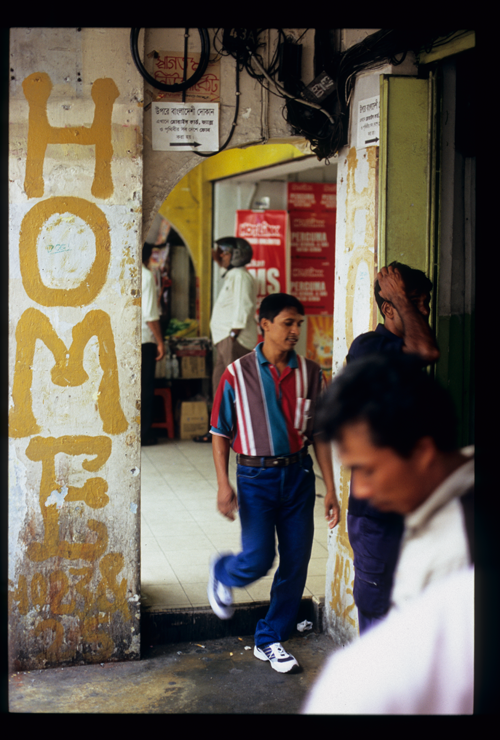 Migrant workers make up some twenty percent of Malaysia's workforce. These men and women come in search not of citizenship, nor of adventure, but simply to earn a living. Many leave behind husbands, wives, and children and stay for years, even decades. After the sound of the voice of a loved one, nothing quite relieves the pain of homesickness like flavors that conjure memories of one's birthplace. For migrant laborers, weekends offer the opportunity to buy phone cards, stock up on imported groceries, and lose oneself in the taste of home amid the company of compatriots. On the first floor of a Jalan Silang shop house, Nepalese men and the odd woman indulge in cheap pitchers of beer, rice plates of sukuti ra bhat (grilled dried buffalo meat curry), and enormous bowls of thukpa (soup noodles). The insistent thump-thump of Bollywood hits from the shop below shakes Restoran Khukri's floor, but no one notices. Engrossed in coversation, customers compare notes on employers, share letters from family, and discuss political developments in Katmandu. The Khukri's owner wishes ever day was Sunday. 'We're struggling the rest of the week, but we can always count on a steady trade this day,' he says. 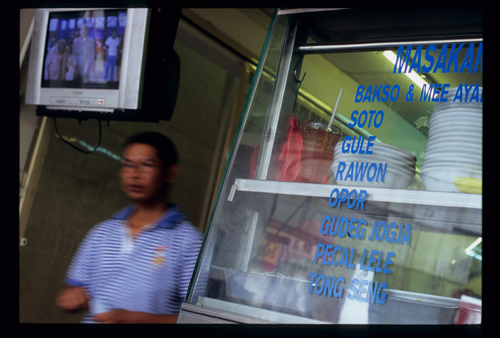 Just outside Chinatown's Madras Lane food court Yeecho, a hawker recently arrived from southern Burma, serves daily specials like ngar oo hin, fish eggs in dry curry, and khauk swe thohk, sesame and chile-dressed cool noodle 'salad', to a steady stream of countrymen. 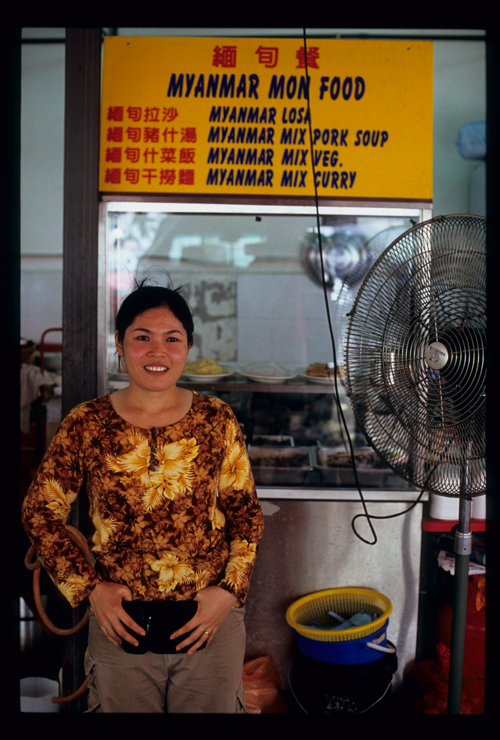 'I cook for fellow Burmese. 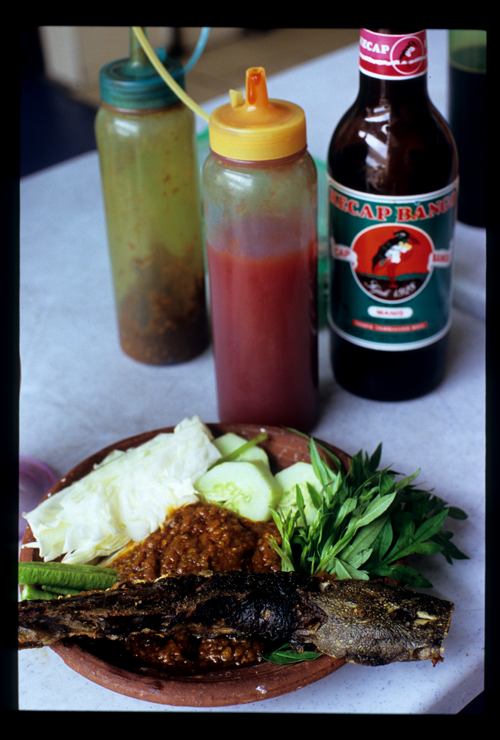 The want food that tastes as it does in Myanmar,' says the former primary school teacher. On Sundays the approach to KL's St. John's cathedral is briefly transformed into Little Manila, as Filipino maids stake out squares of pavement from which to peddle home-cooked goodies. Savories like adobo, long-cooked pork stew, and sweets such as suman, leaf-wrapped logs of coconut-scented glutinous rice, quickly sell out. But comraderie keeps the ladies hanging around long after mass has ended. Those in search of sit-down fare convene at Kota Raya, where Esther and her colleagues serve Philippine fare (and sell bottles of hard-to-find bagoong, a budu-like essential Philippine condiment) from a shop at the shopping center's top-floor food court. Lydia, a southerner on her fifth year as a maid in KL, says speaking Tagalog with other Filipinos over a plate of langunisa (pork sausages) is a comfort. On the first day of the week Thai expats crowd around a white catering truck parked in front of Pandan Indah's Thai Font Market. The array of home-cooked foodstuffs is enough to make a homesick Thai swoon: somtam (green papaya salad) pounded to order, kanom jeen (thin rice noodles topped with a variety of curries), laab khua (a highly spiced dish of chopped pork and parts), and more. The scene - families working their way through dish after dish and single laborers lingering over chitchat, bowls of noodles, and bottles of Singha beer - is reminiscent of any neighborhood eatery tucked away on a Bangkok soi (side street). Here, among folks enjoying authentic flavors on a hard-earned day off, those famous Thai smiles are much in evidence. Gawn, a northern Thai with a ready handshake and a friendly smile, is a regular. 'I'm here every Sunday. Every Sunday! I never miss it!' And just what is it that draws him to this out-of-the-way corner of the Klang Valley? As anyone who has spent extended time overseas knows, the taste of home can be a comfort beyond compare. This most recent post was about so much more than food. Thank you for so eloquently and compassionately spotlighting these vibrant parts of KL and its inhabitants. This is a really great article. Very touching. That I know for sure - "the taste of home can be a comfort beyond compare." It why I write my weekly column, for a taste like home.